The past couple of days have been resting days, yet again. I’m off the chemo pill this week, so it makes no sense that I am so weak. Maybe I picked up yet another virus? All I can do is lean into resting, yet again today. While I lie in bed, I often listen to a number of teachers, who help me to think about my faith. Today, I spent a bit of time with a teacher in Jeremiah 2, in the Old Testament. “Your wickedness will punish you; your backsliding will rebuke you. Consider then and realize how evil and bitter it is for you when you forsake the LORD your God and have no awe of me,” declares the Lord, the LORD Almighty.” Jeremiah 2:19. What was the underlying problem for God’s people? No awe of God, no reverence or holy fear of God. So, I got to thinking….In my moments of sin, I am not in awe of God, but of something else – maybe my comfort or happiness or pleasure or success or my reputation. I do think, as a Jesus follower, the Holy Spirit prompts us to keep away from malice, envy, bitterness, all the sins mentioned in 1 Peter,etc. but we don’t always heed God’s promptings. I think, at that moment, what we/I treasure or what we are in awe of, directs our actions, thoughts, words. As I have spent, and continue to spend, so much time lying in bed, resting, seemingly doing nothing… the Lord is working away. He has repeatedly convicted me of my sins over the years, lovingly prodding away at my lack of awe-led obedience moments, for so many years, in so many situations. I weep hot tears with Him when I think of my lack of obedience and head-strong actions. I ask His forgiveness and mercy for choosing: comfort, pleasure or happiness over obedience, as I endlessly nap. These are dark, hard, hard days of destroying cancer cells, and, sigh, some good cells, too. However, I imagine these are golden days in tearing down lesser things taking my worship while building up my God-awe, by my confessing sin/rebellion, in so many hidden corners He is revealing in my soul. Then, He is building God-awe in those torn down places. My only hope is in knowing I am that tree (Psalm 1) God planted in streams of living water, with my roots digging down deeper than they’ve ever had to go before. And it’s truly painful. However, my awe-filled soul roots, can be in nothing less than Jesus and His righteousness. God is making certain of that. Life was crazy busy on Long Island, NY, right next to the Big Apple – the City that never sleeps. I lived there nearly twenty years, often living life too fast, too full. In those days, I had a busy husband along with four lovely, fun-loving, beautiful, busy daughters. We lived and worked at a private, busy boarding school. I worked part time jobs AND raised my daughters. I set my art-making aside, something I regret, but I put one hundred percent into caring for my husband, my girls, and my home. During that season of my life, busyness could often be confused with significance, especially for this growing follower of Jesus still learning how much I was accepted and loved by God apart from my efforts. I read through my Bible fast, over and over. (Now I meditate on one or two verses per day, slowly.) I drove fast, I ran fast, as fast as I could to train for a half-marathan. I ate fast, I talked and listened fast. Life was fast. Sigh. Breathe. All the busyness and fast pace living would ebb away as I piled my four daughters in one of our old cars and headed to the beach – hopefully by mid-morning. Each summer day. We lived minutes away. Running away from busyness to live on the beach was our dream. We packed sandwiches that wilted, snacks that gave out too soon, and beverages that had to be replenished at the beach water cooler. As we pulled into the Bookhaven Bathing Association, simply known as the BBA, my tense shoulders would fall slack, and sudden joy would permeate by soul. We had made it to the beach once again, and we would be OK. My daughters would spill out of the car laughing with brightly colored shovels and pails, ready for deep exploration in shallow pools. We set up beach chairs and blankets, being careful to keep sand off, knowing full well the blankets would be full of sand by day’s end. The girls would scream and run into the water on hot days. I entered more slowly. On cooler days, the girls kept on their sweatshirts until the heat reached our swath of the beach. I’d set up my low chair right near the waters edge to dangle my feet in the playful tide. Friends would call out to each other; the kids would spot mysterious sea creatures and shout happily to each other to come look. I always found a fellow mom there. One big highlight of the day was for Vinnie, the ice cream man, to arrive ringing in with his cheery music. The girls would beg me to stay long enough for Vinnie to come. I usually gave in. (I was happy to get my cold, cardboard-like nutty cone!) The girls would get snow cones or bombs or popsicles if we only had dimes that day. What joyful memories I have of their bright red or purple tongues and lips from their late afternoon beach treats. Their hair might be blowing wildly as they licked their delicious, sticky, sandy treats. As the girls got older, they enjoyed inner tubing on the inlet waterway across the street from the BBA. A spit of water would begin there and then lazily curve around the Gamecock Cottage and onto the edge of the Long Island Sound. The trick was to stay close to shore when your inner tube went around the Gamecock Cottage. This was high adventure, and a sort of rite of passage if you did the inner tube around the cottage trip. We have one or two harrowing stories of that not quite happening, and the girls needing rescuing by a passing boat! Legends were made on those days. High tide – perfect for tubing around the Gamecock Cottage, but stay close to shore! The girls grew up, and life changed. One day, when I had started painting again, I walked down to the shore’s edge of the Gamecock Cottage. It had just finished raining; the tide was dead low. With the sun coming out, I thought there might be a reflection in the water. I slipped and slid through the grasses and mossy sand. I was not disappointed. There was, indeed, the reflection the sun had made possible. I had slowed down my busy life, enough to catch the first glimpse of a brand new reflection on the water’s surface. No one was around. It was quiet. It was sacred. I sketched a little, I photographed the moment, and headed home as the now, full sun, beat down on me. I finished the painting on my kitchen table. Today, I received an email that my 16×20 museum quality gicleé prints of the Gamecock Cottage are being shipped from my printer in Seattle. (Of course I’ll give each daughter one.) It was probably 20 years ago that I painted this, but my dreamy beach memories are as fresh as if they were yesterday. I am so thankful for these memories with my girls, and for all the sacred “slow” times we had at the BBA along the Long Island shore. Well, except for those near drifted out to sea memories!!! 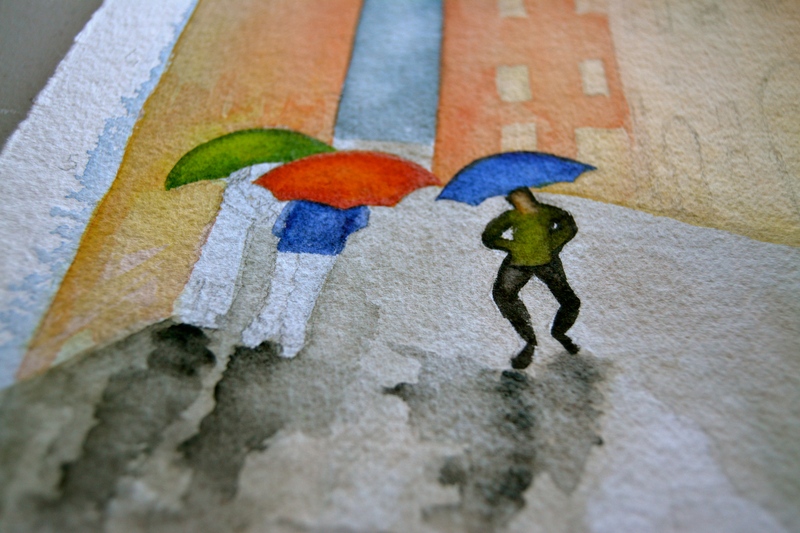 I have had the thrill of painting in Lucca, Italia during several summers, in recent years. 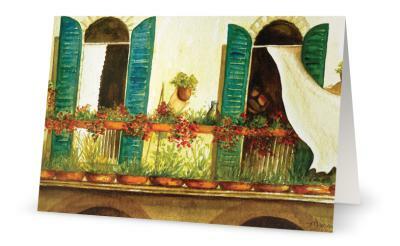 I love to paint a balcony scene that is on a large square with an important cathedral. The real windows are often closed because of the hot, summer sunlight. 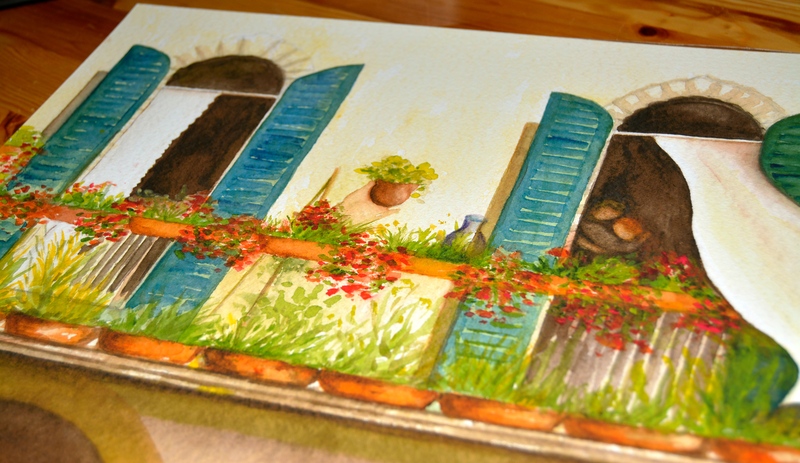 When I have painted the scene, I have flung open the windows and added a couple in love. Love on Valentine’s Day – or in Italy, any day! I have museum quality gicleé prints on German etching paper available for sale, as well as blank cards, of this lovely scene. Here is the young couple in an embrace. The curtain is blowing to represent life and love. The days I have spent in Italy have been grace-filled days. They have been days filled with beauty, good food, kind friends and lovely color everywhere. Such beauty has been restorative to my soul, mending fragile areas, and encouraging my heart. 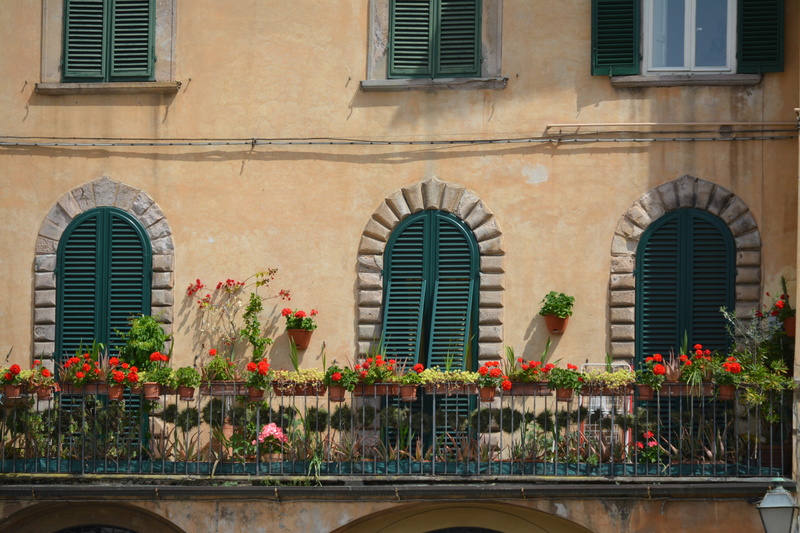 This particular balcony has many pots of bright red flowers and flowers hanging on the stucco walls. The lively reds help me to see past dark days fighting cancer, and dark days healing from hard parts of my story. 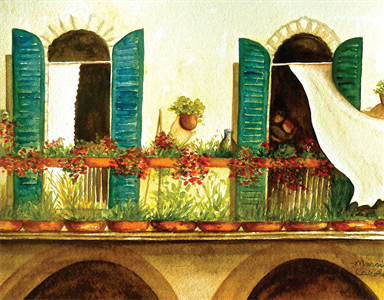 I have seen the windows open when I was on one, maybe two, of my trips to Lucca, and it was fun to see the long white curtains blowing a bit in the breeze. Such life! 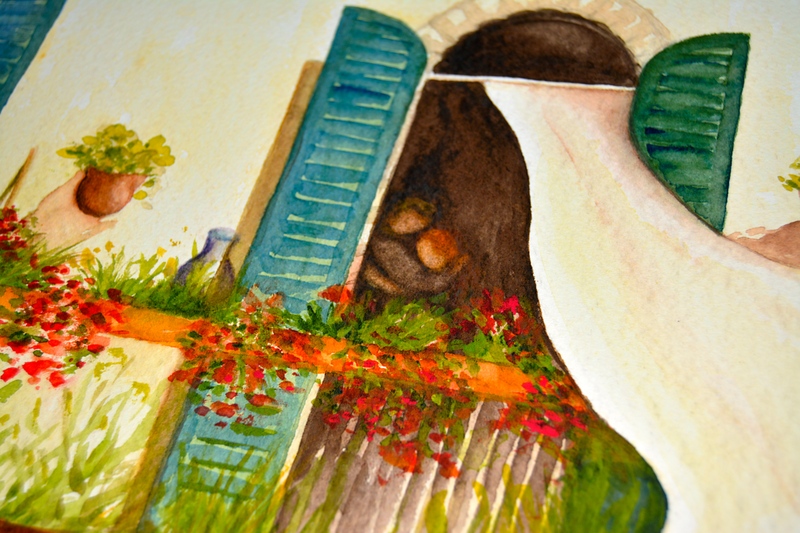 I have exaggerated the blowing of the curtains in this watercolor. The wild curtain expresses my joy I have experienced in this town. 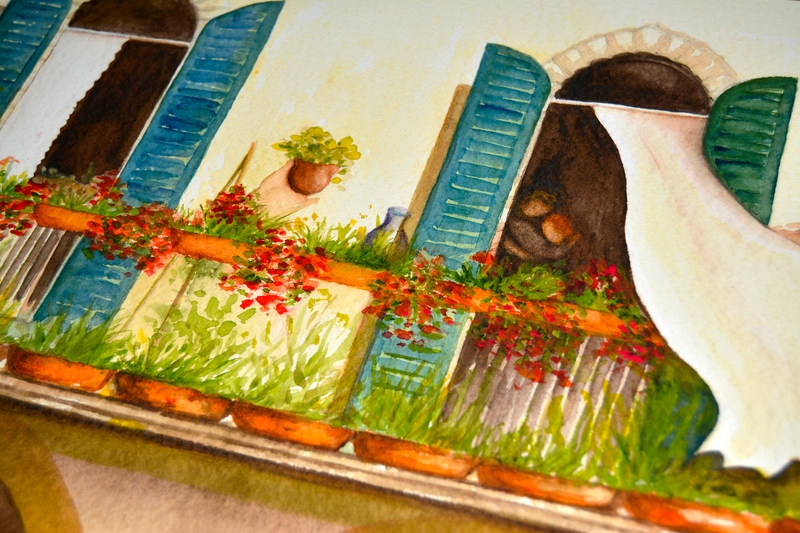 I’ve used washes of sienna to suggest shadows under the pots. 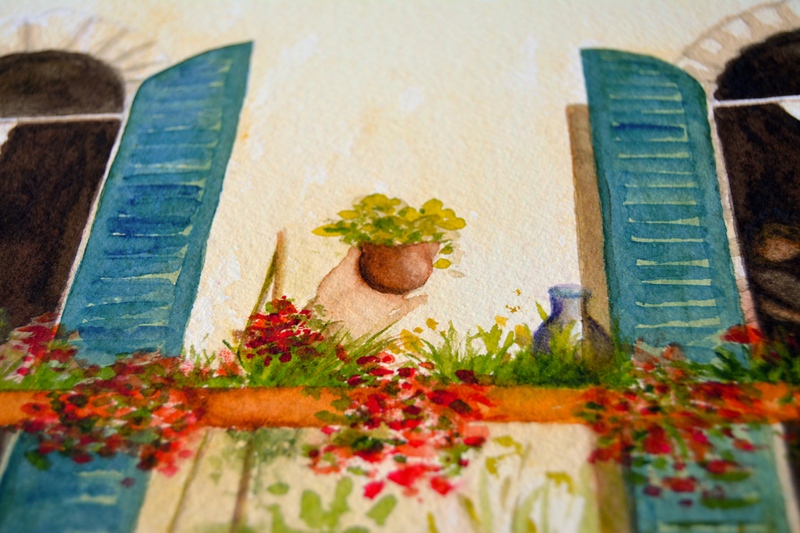 A blue vase is casually tucked by one of the window shutters. Here is a photograph of the real balcony in Lucca with the windows closed. It’s a much more lively scene to have the windows open! This photo must have been taken during the heat of the day, or when I was wandering around early in the morning. If you’d like to buy a print or a set of cards, please let me know at marcia2010@swissmail.org. The prints are 11×14 for $40 / includes shipping costs. The cards are 10 blank 5×7 cards for $25 / shipping costs included. Please include your hard copy address when you email, and I’ll give you an address where you can mail payment. I only have 10 prints in this edition. Enjoy love in Italia! The front of my art cards. 11×14 gicleé museum quality print. 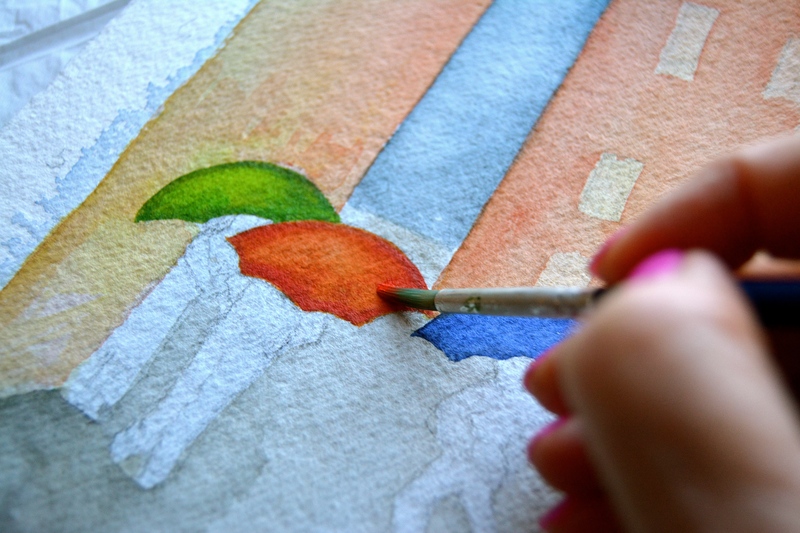 Nausea Interrupted – So, Make Art! So, I’m an artist, and that means, time to paint! I put on James Taylor Christmas, danced, sang and painted. My heart is full. I love my Daniel Smith watercolors. The colors sing right along with James Taylor! I worked layers of various reds, then threw some red around in the background. Here is the painting, just about completed. I added a few more layers here and there, then found a frame I had here at home. I put my happy painting right in it! I was actually so happy, I started crying. It’s so huge not to feel sick for a few hours. What a blessing! I am still waiting for healing…..this advent, I am waiting for Jesus in many ways. Blessings to each of you today! After I came home from my latest oncology appointment, I sat in the sun and took a short walk, thinking that would cheer me up and wipe away my tears. Cancer is hard, no way of getting around it. The sun felt good on my face, but the walk was a struggle and reminded me of my cancer lingering in my lungs. I decided to take a nap. It was sort of a way of escaping for an hour. I got up, and I forced myself to dip my brush in bright red paint. 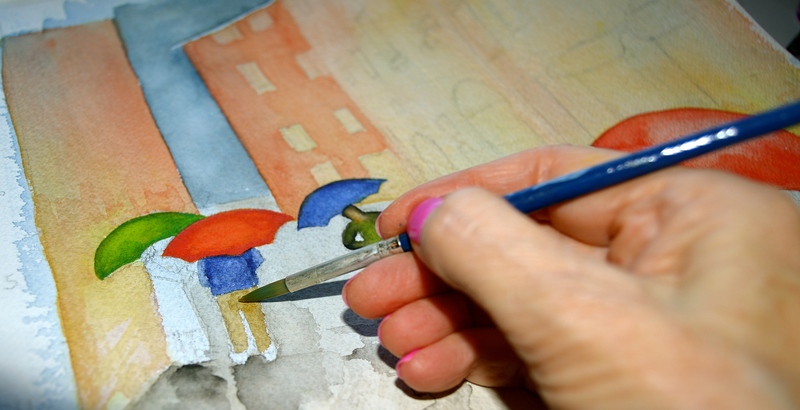 I so want to complete this painting of Lucca, Italy, when I was there on a rainy, May afternoon. The bright colors I chose cheered my soul a bit. I love watching the water and paint move into places I direct it. And, I enjoy the happy wiggles of black I add as reflections on the wet cobblestone. The figure in the middle of this painting represents a man named Mario, who really lives in Lucca. Since I’ve been to Lucca four or five times, I’ve become more at home there, and even have folks there I count as treasured friends. I know Mario because I’m not just a tourist who breezes through for an hour in Lucca. Mario darts about with a little radio/music player. He likes to play it as he happily wanders about the many streets of Lucca, and he often sings opera along with his music. Maybe the locals have tired of him, maybe they love him. I certainly enjoy seeing him singing in his own happy world. I stop and listen to him, because I want to give him the respect I have for him. 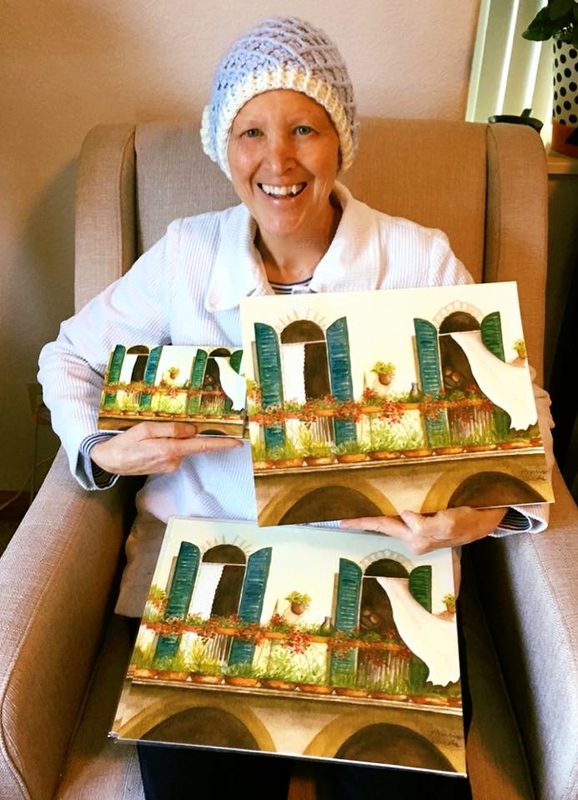 I’ve decided to take a lesson from Mario, and paint during cancer treatment. I certainly do not have one hundred percent energy these days, and my fingers are wobbly from neuropathy. These are two good reasons not to paint. However, I got back to this watercolor once again today, because, well, if Mario can sing opera in his world, I can paint in mine! 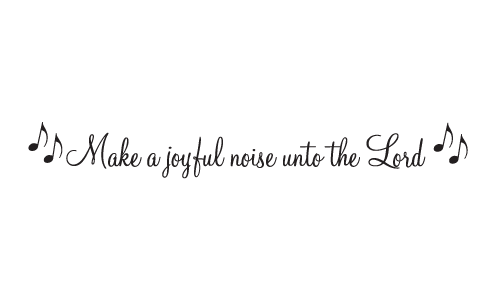 It’s my way of making a joyful noise in my hard world of oncology. I think Mario would approve.